When writing about strong designs I recall compositions that have communicated with me in very direct ways. The impressions that I receive when looking at these compositions may bypass words altogether, and instead be experienced as a brief, sequential movement of energies through my body. These physical experiences may, in turn, produce corresponding emotional or ideational experiences. 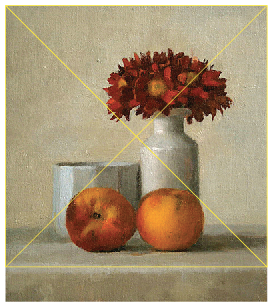 For example, when looking at this still life painting (Fig. 1) by Colleen Cox1, I experience a kind of visceral collectedness. A certain stillness. Next, I become aware of an interplay between visual symmetry and asymmetry, and some subtle movements begin. In studying this composition geometrically I see three worlds altogether. 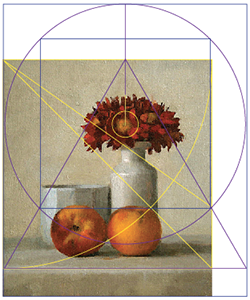 The first world is about symmetry, and it’s main characters are the two peaches, symmetrically centered along the horizontal dimension (Fig. 2). The second world is asymmetrical, and it’s actors are two vessels. One wide, the other narrow. One higher, the other lower. One full of flowers, the other perhaps(?) empty (Fig. 3). The third world extends beyond the visible painting. In this world the peaches and vessels begin to move away from the center, but a new symmetry emerges (Fig. 4). This new symmetry has no actors to speak of, unless it’s an unassuming daisy that faces out toward the viewer. In any case this lighter-colored daisy becomes the center of a circle. A square is nested inside of this circle. An equilateral triangle is nested inside of the square, and it then projects its way downward until it rests on the table top. I think that the visual story of this particular painting would make a wonderful compositional basis for a verbal story having to do with different layers of reality. If anyone knows of such a verbal story (a poem, a short-story, an “about us” page of a website dedicated to sustainable design?) I hope you’ll post it here. 1 The title of this painting is Red Daisies and Peaches. More paintings by Colleen Cox can be seen at Neptune Fine Art. I think you did a great job analyzing Colleen’s painting. I especially like your description of your personal reaction to her work as beginning with a sense of peace and stillness, followed by a sense of energy. I also experience this dual response when looking at her work: serenity and quiet which is charged with an intense sense of physical presence of the objects, of light, weight and color. There is a sense of the illusion of physical solidity and the fleeting quality of all natural life. The similarity in our responses to these compositions brings up a lot of questions for me. Maybe this similarity could be seen as a sign of a clearer form of communication than that which I would normally experience through the use of words. Unlike the compositional variations in our verbal languages — and the many different interpretations that come out of the things I may verbally write or say — the composition of our physical bodies seems more universal, and less dependent upon time and geographic location. I think that this makes the physical body a very good vehicle for communicating with others. In relating my physical body to two-dimensional, visual compositions, I might represent a knot in my stomach as a point, a shiver up my spine as a line, and a wave of happiness (or sorrow) as a plane. This may sound like something out of a (low budget) science fiction film, but what if we could develop the capacity for experiencing the flow of energy in our bodies in connection to a particular idea or feeling, and then “map” this energy movement using points, lines and planes on a two dimensional surface? A hundred years later, in another part of the world, someone would stumble upon this map, and, in seeing these points, lines and planes would immediately experience the same movement of energy as that of the mapmaker. This physical experience, in it’s turn, would allow this future person to decipher the map, and re-create the mapmaker’s idea or feeling. It would be a glorious way of communicating.